If you've walked by the Dining Services office in the Cone Center lately, you might think that it looks more like a research lab than an office. Shelves with glowing LED light boxes and seedling trays line the window. The bright lights cause students and staff to stop and look at the progress of the seeds as they start to emerge from the dirt. Some of them have even asked suspiciously about what is growing in the small containers. 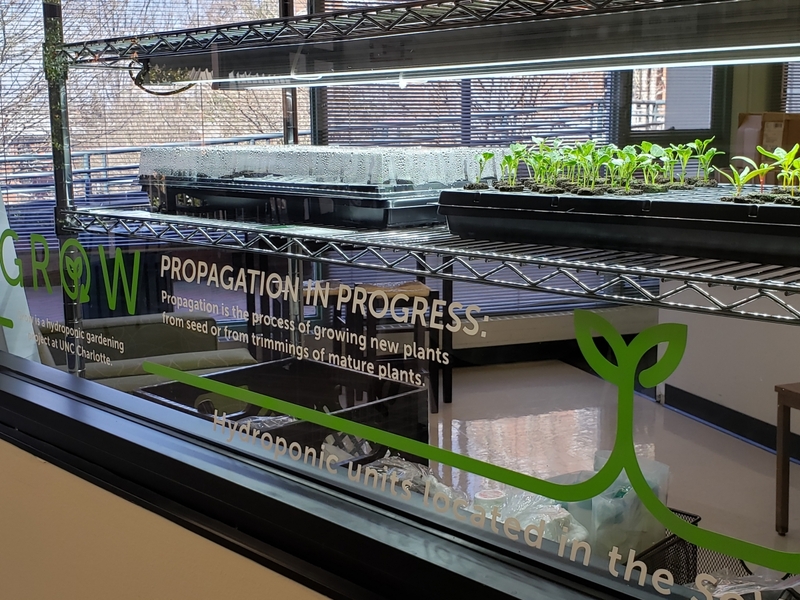 The mysterious sprouts are part of Dining Services' new program called GROW Hydroponic Gardens that cultivates produce for the dining halls across campus. Chartwells, UNC Charlotte's dining services provider, has recently placed two double-sided, vertical, hydroponic towers at the entrance of SoVi. The tower gardens allow plants to grow with minimal resources once the seedlings mature enough to be transferred to the unit. Lindsay Klingenschmidt, Dining Services nutrition and sustainability specialist, starts the seeds in the greenhouse boxes, where they take about two weeks to get big enough to transplant. She then transfers the plants to the towers and is able to harvest them after four weeks. Klingenschmidt has to spend about four hours a week tending the plants and making sure they get fresh water. It takes about six weeks to complete the entire process. Since beginning the program, the gardens have yielded four harvests amounting to 17 lbs. of produce, which included a variety of lettuces, kale, basil, cilantro, oregano and parsley. Bok choy will be included in the next harvest. Dining Services has found creative ways to use the food produced in the garden towers such as Teaching Kitchen events, Earth Day and at the salad stations in SoVi and Crown Commons. The GROW Lacinto Kale and Bright Lights Swiss Chard will be featured at the upcoming Flavors of Spring luncheon at Bistro 49 on April 25. In addition to providing fresh produce, Klingenschmidt believes that the hydroponic gardens serve a larger educational purpose. She said that she uses the towers "as a teaching mechanism for students so they can see how their food grows," and she loves seeing students "develop a connection to their food." Hydroponic gardening has a number of advantages compared to traditional gardening. Growing plants in the towers reduces the need for commercial fertilizers and pesticides. The units are conveniently narrow with casters so they can be placed indoors or outdoors where there is access to an electrical outlet, growing hyper-local produce, or produce that is grown close to where it's consumed, possible all year-round. 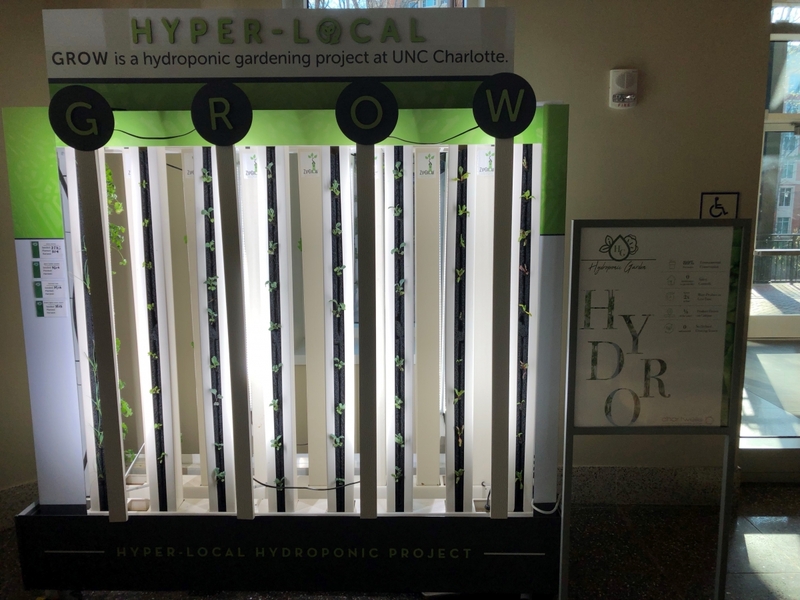 The GROW Hydroponic Gardens are part of a long-term effort to make dining services at UNC Charlotte as environmentally-friendly as possible. Both SoVi and Crown Commons dining halls recently earned designations as 3 Star Green Certified Restaurants(R) by the Green Restaurant Association. Charlotte, NC – SoVi Dining Hall and Crown Commons were recently certified as 3 Star Certified Green Restaurants® by the Green Restaurant Association (GRA), a national nonprofit organization helping restaurants to become more environmentally sustainable. 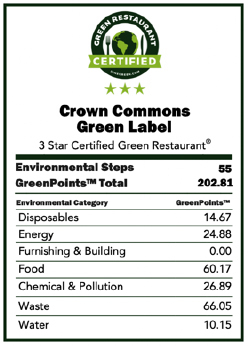 Collectively, the dining halls received 404.54 GreenPoints™ on the GRA’s rigorous certification scale and implemented 116 environmental steps. Facilities are Styrofoam free, which keeps harmful chemicals and litter out of our environment. Composting food waste and recycling plastics, glass, aluminum, cardboard, and paper can keep up to 90% of waste out of landfills. Over 40% of the main dishes are vegetarian, which significantly reduces the carbon footprint associated with our food. 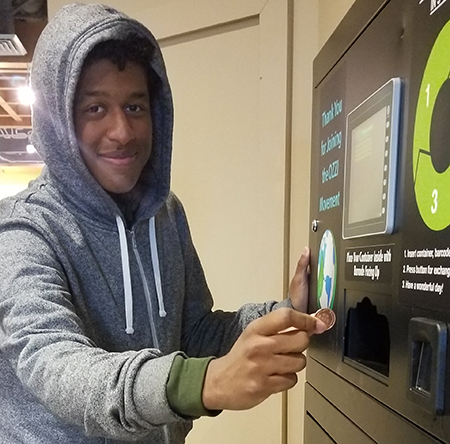 Not offering bottled water and providing a bottle filling station, encourages students to bring and reuse their own cups and water bottles, therefore not contributing to the 4 billion pounds of plastic bottles that end up in landfills each year. SoVi's detailed Green Label and environmental steps, here. At least one dining hall, either Crown Commons in the Student Union or SoVi in South Village Crossing, will be open and on the weekend brunch schedule, even if campus is closed. More likely than not, both dining halls will be open. Dining services will have staff persons staying overnight on campus to ensure it. 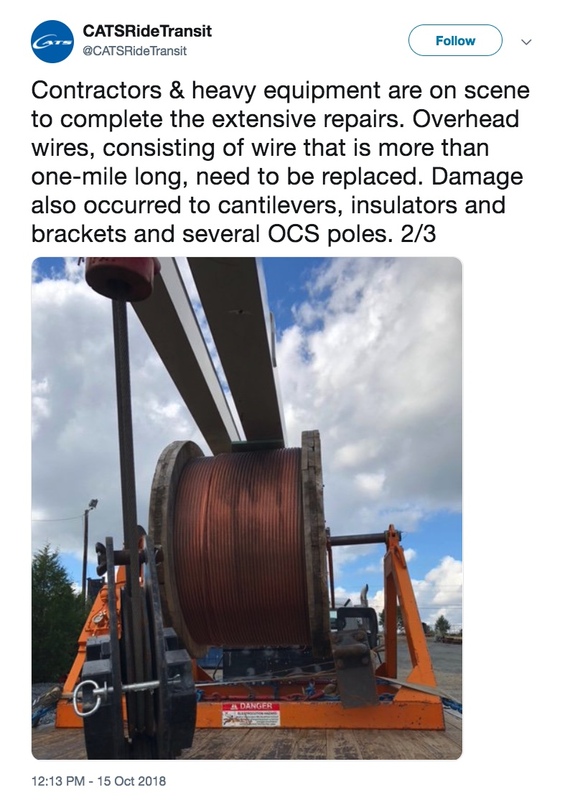 Outtakes convenience store and other retail venues will follow according to an established inclement weather protocol as personnel are available. Due to the timing of this particular storm, opening Peet’s in Atkins Library is a high priority. 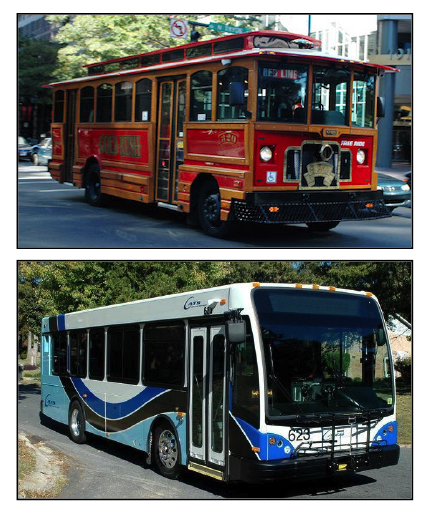 Niner Transit buses will run as long as campus road conditions will allow. 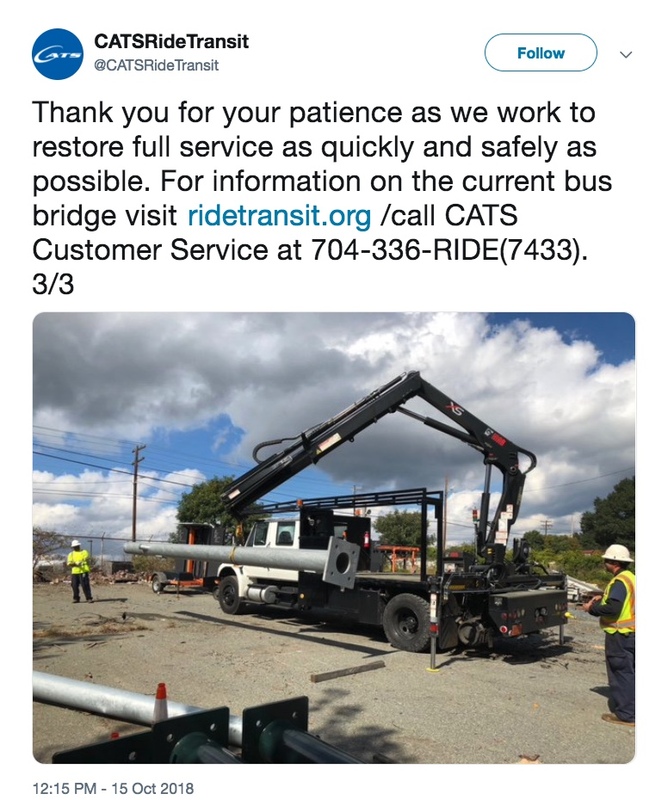 Do expect that service hours may end earlier and routes may need to adjust. 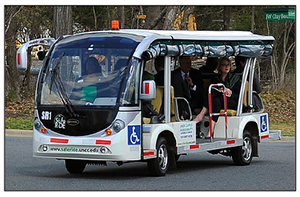 Check for updates often at nextride.uncc.edu and on Twitter, @unccnextride. 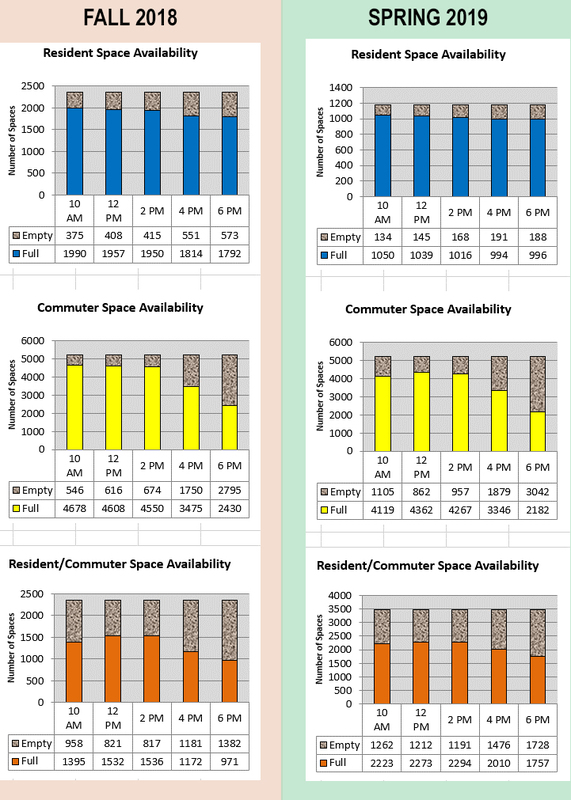 Top levels of all parking decks will close. If your car is parked on a roof level, please move it to a lower floor. 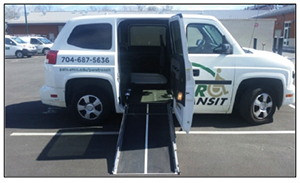 Best place to park on a covered floor of a deck that coincides with your permit privileges. If asked to list things a university needs to support its educational mission, vending machines would probably not make the top 10, or even 50. But we know that hardly anyone goes through a week on campus without needing a hydration, energy or caffeine boost. That’s why Auxiliary Services and vending partners Coke, Pepsi and Canteen, have undertaken a project to expand payment options on campus vending machine readers, making it easier to get the refreshment you need. 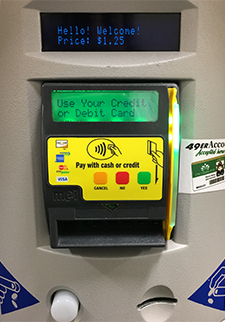 The task was completed this month; over 180 beverage and snack machines now accept bank cards, mobile payment and 49er Account in addition to the usual cash and change. Almost all campus vending machines offer the upgraded capability. However, there remain a few that do not because the cell signal required for operation in their location is insufficient. Those machines will have card readers that accept the 49er Card. UNC Charlotte has 201 vending machines: 125 beverage, 71 snacks, five coffee. Vending proceeds provide amenities like outdoor seating, tables and patio umbrellas, and support several programs that benefit students, faculty and staff. 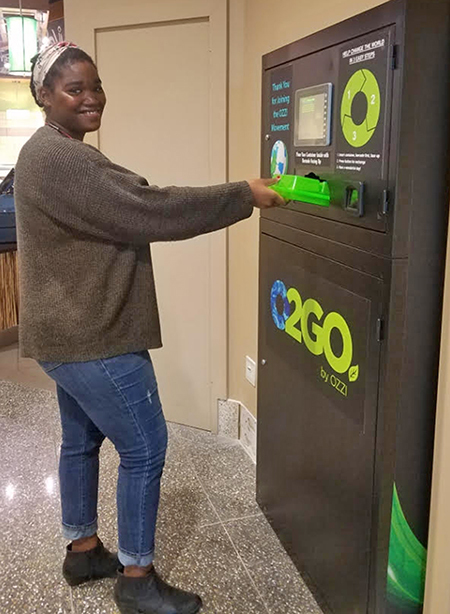 Another kind of vending machine, featuring the OZZI® patented reusable container system, has been installed on the upper level of South Village Crossing. It’s one more step toward a zero-waste goal, offering SoVi2Go an alternative to containers that are disposed after one use. Purchase a BPA-free O2GO container at SoVi2Go. Price is $5.74. You may use campus spending accounts, 49er Account, DB or ODA. Fill it up with food at SoVi2Go. Return the container to the OZZI machine. No need to wash or rinse it! The machine will dispense a token. The OZZI® machine is a Chartwells Higher Education sustainability initiative that is being rolled out to other university accounts across the country. It only takes a few thousand O2GO containers in rotational use to eliminate 1,000,000 single-use containers ending up as garbage.